Banana and Nutella Whip…absolutely delicious. While sifting through “Amazon recommends” suggestions I came upon this little beauty… the iSi Whip. 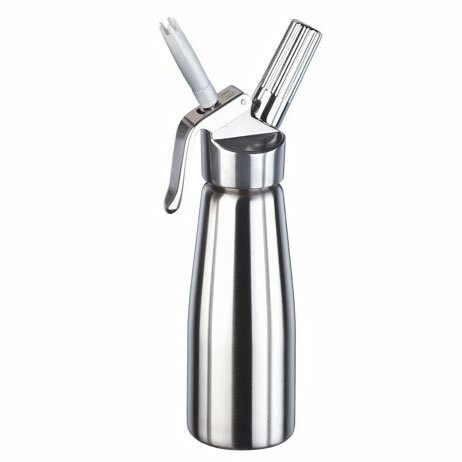 Although the recipes are few, the idea and the possibilities behind the alternate use to a simple whip cream maker is a thought-provoking mind morsel. Blend thoroughly and pour into canister. Screw on the Nitrogen charger capsule, shake and let sit sideways in fridge for 1 hour. Serve with sliced bananas and a sprinkle of cinnamon. There are aerating settings on blenders... usually makes more air in my drinks than I like... They are so bubbly they reduce to a quarter the size after they "de-puff"
hey if i just stirred really fast and a lot would that work? No, it's not so much whip cream as it is more banana puree and nutella. It needs the N2O to aerate it.